The mullahs ruling Iran are trapped in political, social and economic crises as the result of their long-standing policy of domestic suppression and exporting terrorism abroad, immensely wasting the national wealth. This destructive policy has culminated in Iranian people’s uprising. People are unable to make their ends meet because the regime is providing its proxies and terror operations abroad using the wealth that should have provided its people. Reimposing economic sanctions by the US has deteriorated the regimes economic condition. In this circumstances, a recent promising message from the Iranian Resistance’s leader Mr. Massoud Rajavi, on entering the phase of readiness for regime change, has strengthened the Iranian people’s spirit. As expected, the message has been widely welcomed by the members of the resistance units, the network affiliated to the People’s Mojahedin Organization of Iran (PMOI / MEK) inside the country. Some resistance units from Semnan, Ahvaz, Larestan, Tehran, Qom, and Isfahan expressed their readiness in response to the message of the Iranian Resistance leader, Mr. Massoud Rajavi by sending messages. 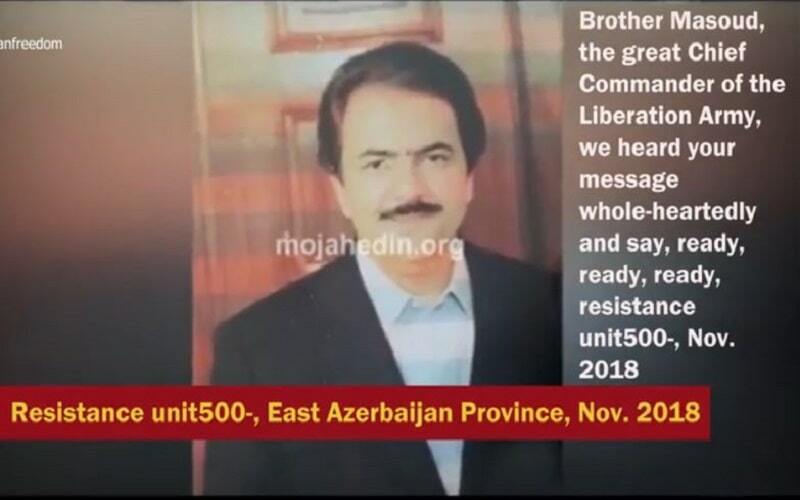 Some of the resistance units responded to the message of the Iranian Resistance leader Mr. Massoud Rajavi by increasing their anti-regime activities. They vowed to promote the popular protests against the clerical regime. Following Mr. Massoud Rajavi’s message, the resistance units stepped up their activities. They set ablaze many posters of Khamenei as the icon of suppression. Members of resistance units in Tehran, Qarchak and Zibashahr also sent similar messages and set fire to images of the Iranian regime Supreme Leader Ali Khamenei. In West Azerbaijan Province (northwest of Iran), members of the resistance units put up posters in support of the message and promised to keep the flames of the Iranian people’s protests alive. The resistance units in the cities of Kermanshah, Sary, Tehran, Karaj, Orumiyeh, Qazvin, Isfahan, Mashhad, Tuyserkan, took to graffiti of anti-regime slogans and posted tracts on the walls. They also set the Khamenei’s banners and billboards alight, and put up the poster of Mrs. Maryam Rajavi, as the symbol of the free Iran of tomorrow. The resistance units in the cities of Isfahan, Mashhad, Tuyserkan, and Tehran vowed to extend the resistance units at the schools and the universities.